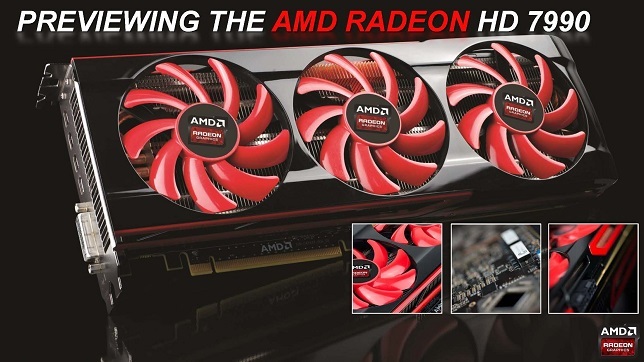 AMD has been pushing multi-GPU graphics cards since 2006-2007 and often emphasised such approach as the best way to build top performance cards. Surprisingly, during this GPU generation, while Radeon HD 7970 launched 4 months before GeForce GTX 680, which was quickly followed by dual GPU GTX 690, AMD's official HD 7990 never materialised. Some AMD's partners have built their own dual HD 7970 on one card and called them HD 7990, but they weren't based on any reference design by AMD. During GDC 2013 AMD have finally announced their own Radeon HD 7990, codenamed "Malta", consisting of two Tahiti XT chips (HD 7970), clocked at over 1GHz with 3GB VRAM per chip. They also revealed that Battlefield 4 single player demo ran on HD 7990 and claimed that it is the faster graphics card in the world. No more details or pricing have been mentioned yet. As for performance – let's wait for its release and independent reviews. That is especially important for this multi-GPU card, as some latest benchmarks show important problems with HD 7970 Crossfire implementation. There is also some news for those who don't want to or can't spend near a grand on graphics cards alone. During last few weeks, both Nvidia and AMD have released a new card each in $150-$170 range. AMD Radeon HD 7790 with 1GB VRAM fills a price spot previously occupied solely by GTX 650 Ti in this generation. It delivers a very good performance for the price, often outperforming HD 7850 1GB and GTX 650 Ti. Another important addition – HD 7790 has a new power management system, allowing for very quick adjustments of power draw and performance, making it a very efficient and silent card. AMD will also include BioShock Infinite with HD 7790 making it a very enticing offer. Nvidia was quick to respond to the new challenge, by releasing GeForce GTX 650 Ti Boost this week. As far as naming goes, Nvidia disappointingly returns to using a lot of suffixes instead of just numbers in card names. Card comes in 2 GB version for $169 and 1 GB for $149 and offers a better overall performance than HD 7790. The problem with 2 GB version of GTX 650 Ti Boost is the 2 GB HD 7850 for $179. It also consumes less power and is more silent than GTX 650 TiB, as well as offering free games on purchase. All things considered, these new releases make the popular $150-$200 graphics cards range very tightly packed and very competitive. The only downside of such abundance is that sometimes it is hard to make a final purchase decision, when every additional few pounds in your budget get you a better card. @Neon Titan wasn't the next gen and this year we don't have the next gen cards...if you don't count the mobile crap. AMD has been making the mistake a lot lately to release their next generation of cards before Nvidia and then Nvidia sweeps in with epic value cards (in terms of price to performance ratio) and completely outsells AMD in the marketplace. I think the only thing stopping them from increasing their sales/market share more is just that they know if they get too greedy, then they can be classified as a Monopoly and the government could potentially step in then. So better to keep AMD in business from a business standpoint of Nvidia.